The U.S. Energy Information Administration reports that residential energy consumption per household has decreased over the last 30 years. Improvements in building insulation plus more efficient windows, heating and cooling equipment, and major appliances have more than offset the increase in the average size of homes and the dramatic rise in the use of consumer electronics. The EIA's most recent (2009) Residential Energy Consumption Survey details this shift in how energy is consumed in homes. It found that heating and cooling no longer account for the majority of home energy use, down from 58 percent of home energy consumption in 1993 to 48 percent in 2009. Making up the difference is the growth in energy consumption for consumer electronics and appliances (including refrigerators), up from 24 percent in 1993 to 35 percent in 2009. 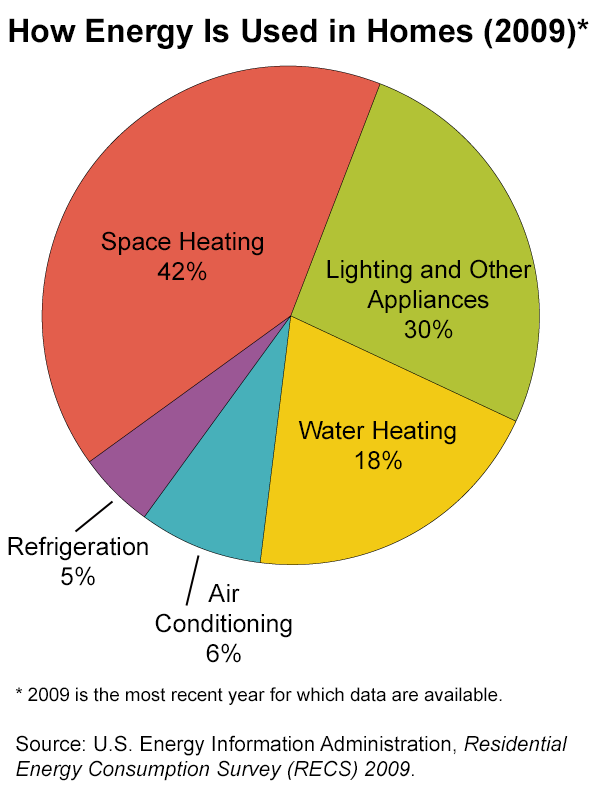 More specifically, the survey found that space heating accounted for the largest share (42 percent) of energy usage in homes, followed by electronics, lighting, and appliances (30 percent), water heating (18 percent), air conditioning (6 percent), and refrigeration (5 percent). Home energy consumption is responsible for a major fraction of the average American's carbon emissions -- roughly 32 percent, according to the Union of Concerned Scientists -- and offers significant opportunities for greater efficiencies. The first step in making our homes more efficienct is to get some answers to basic questions about our energy consumption. How much energy do I use right now. How is that energy produced? What is the environmental impact of the energy I use? What can I do to make a difference? HOW MUCH ENERGY DO I USE RIGHT NOW? Start by becoming familiar with the information contained in your natural gas and electric bills and then track your energy usage from month to month. This will make you more aware of just how much energy your home is consuming and more conscious of energy issues generally. It can also provide a big incentive to test various strategies to improve your home's energy efficiency and will help you monitor the impact of those changes. The "meter reading" section of the typical gas bill reports the amount of gas used during the current billing period. This is often reported in terms of hundreds of cubic feet (CCF). The volume of gas used is converted from cubic feet into therms, a measure of the heat, or energy content, of the gas. (One hundred CF of natural gas is roughly equal to one therm.) The number of therms then serves as the basis for calculating the various charges on the bill. How do you know whether the number of therms you used is "reasonable"? The answer to this is . . . it depends. It depends on how cold it was outside. Degree days are used to calculate the effect of outside air temperature on building energy consumption. Heating degree days (HDDs) are a measure that indicates how much colder the outside average temperature was compared to a baseline temperature of 65°F. (This baseline reflects the observation that houses generally require heating if the outside temperature is lower than 65°.) If the average of the high and low temperatures for a particular day was 35°, that would add 30 HDDs to the total for the billing period. Similarly, cooling degree days (CDDs) are a measure of how much warmer the outside average temperature was than 65°F. Dividing the number of therms used by the total number of degree days for that period provides useful information about the energy performance of your house. It reflects the temperature setting of your thermostat, the tightness of your house, and the efficiency of your home's heating system. With this calculation, you can compare your energy consumption from month to month, and year to year, despite variations in the weather and the fluctuating cost of energy. Electrical usage is measured in kilowatt-hours (kWh). (One kWh is equal to using a 100-watt light bulb for 10 hours.) In addition to reporting the number of kilowatt-hours of electricity used in the current billing period, the typical electric bill also provides information showing the customer's usage history to assist in identifying those months in which to expect higher bills and to help homeowners see where lifestyle changes might be made to decrease consumption. Most consumers pay a fixed per-kWh rate for their electricity no matter what time of day or which day they use it. In some areas, however, consumers may choose an alternative system called Real Time Pricing (RTP) and pay a rate based on the wholesale market price of power, which varies from hour to hour and day to day. For much of the day, the "real time" price is lower than the standard fixed price, but at times of peak demand--on steamy afternoons in summer, for example--the price of electricity can soar. RTP customers can save money by reducing their electrical usage during these high-demand hours. (Participants in ComEd's RTP program, for example, have saved on average more than 15 percent on the electricity supply portion of their bills since the program began in 2007.) For the utility, lower peak demand decreases the need to operate more expensive "peaker" plants (to supplement the power from less expensive base load plants), reduces the risk of blackouts, and delays the need to build new power plants. Another rate structure that rewards customers who cut usage during peak periods is Time of Use (TOU) pricing. With this system, the utility company establishes two or more tiers of prices, setting peak and off-peak rates for different times of the day, days of the week, and seasons of the year. During winter months, for example, the peak period may be early morning and early evening whereas in summer months, it may be midday through early evening, reflecting air conditioning usage. The higher rate charged during peak periods encourages customers to shift usage to off-peak hours. WHAT ARE THE SOURCES OF THE ENERGY I USE IN MY HOME? Most of the energy consumed in homes is produced by burning fossil fuels like coal, oil, and natural gas. When burned, each of these fossil fuels emits various greenhouse gases, principally carbon dioxide (CO2). But they differ significantly in the level of emissions that each gives off. Coal-burning accounts for about one-third of the country's total CO2 emissions and is the single largest source of some of the worst air pollutants, including deadly particulate matter, acid-rain-forming sulfur dioxide, and toxic mercury. Oil burns cleaner than coal but still produces large quantities of CO2 for each unit of energy produced. Natural gas is the cleanest fossil fuel. Burning natural gas does release CO2 and other pollutants but at much lower levels than other fossil fuels. It emits half as much CO2 as coal per unit of energy produced and nearly 40 percent less CO2 than oil. Close to three-fourths (72 percent) of the carbon emissions related to operating a home is attributable to the electricity used in the home. This is due in part to the relative inefficiency of most power plants in converting the energy in the fuel they burn into electricity. It typically takes three or four units of fuel to produce and deliver one unit of electricity. The other factor is the electric power industry's heavy reliance on fossil fuels--carbon-intensive coal in particular. Two-thirds of the electricity generated in the U.S. in 2011 was produced by burning fossil fuels, with 42 percent coming from coal, 25 percent from natural gas, and a small percentage from oil. Non-fossil fuel sources accounted for the rest: 19 percent from nuclear power, 8 percent from hydropower, 3 percent from wind power, and the remainder from other renewable sources. WHAT IS THE ENVIRONMENTAL IMPACT OF THE ENERGY I USE? To answer that question, you will need 12 months of data about the energy used in your home. If you do not have a year's worth of utility bills at hand, you should be able to obtain your account history from your local utility companies. To calculate the impact of the electricity you use, add up the number of kilowatt-hours (kWh) of electricity delivered to your house over a 12-month period. Then use the EPA's Power Profiler to find out how many pounds of emissions--such as CO2--are attributable to your annual electrical usage. The emissions released in generating electricity vary from one part of the country to another, depending on the types of fuels used in the power plants in each region. Most regions are quite large, encompassing several states. The resulting emissions profile for a particular grid subregion can be surprising. Northern Illinois, for example, is known as a leading producer of nuclear power, a "clean" energy source. But it is part of a regional transmission network that includes Indiana, Ohio, West Virginia, and parts of several other states. The resource mix for this region of the power grid is 70 percent coal and 24 percent nuclear power. This produces emissions of 1.52 pounds of CO2/kWh of electricity. The average electrical consumption for homes in Illinois in 2012 was 9,200 kWh/year. (The U.S. average was 10,800 kWh/year.) Using the CO2 emissions rate for northern Illinois, the average home in the Chicago area produces some 13,980 pounds of CO2/year. To calculate the environmental impact of the natural gas (or other heating fuel) you use, first determine the number of therms of gas (or gallons of propane/oil) used in your home over a 12-month period. Then multiply this number by the appropriate conversion factor to determine the number of pounds of CO2 generated. One therm of natural gas generates 11.7 pounds of CO2; for propane, it is 11 pounds/gallon, and for heating oil, it is 22 pounds/gallon. The average natural gas consumption for homes in Illinois in 2009 was 1,025 therms/year, producing about 11,990 pounds of CO2. For most Americans, driving ranks along with electrical usage at the top of the list of daily pollution-causing activities. (For others, air travel can be the biggest contributor to their greenhouse gas emissions.) The DOE/EPA Fuel Economy website offers tips for getting the best gas mileage from your car, can help you find and compare cars, and explains the information provided on the new fuel economy label. The EPA's Green Vehicle Guide is another helpful resource. Replace five of the most frequently-used incandescent light bulbs in your house with compact fluorescent lights--or LEDs. Seal and weather-strip ducts, doors and windows to keep warm air from leaking into your house in summer and out of your house in winter. Set the temperature of your water heater so the water is no more than 120�F. Lower the setting on your thermostat in winter and raise it in summer. Install a programmable thermostat to automatically adjust the setting while you're asleep or away from home. Invest in energy-efficient and water-efficient appliances. Use a power strip to turn off electronic equipment with "instant on" features. Recycle aluminum cans, glass bottles, plastic, newspaper and cardboard. When you buy your next car, choose the most fuel-efficient vehicle that meets your needs. If you have the choice, buy electricity for your home from a Green Power source. The EPA details a number of Actions You Can Take at home, at the office, on the road, and at school to save energy. The Union of Concerned Scientists offers Ten Personal Solutions to Global Warming. The U.S. Environmental Protection Agency's Energy and You web pages contain information about the impact of electricity generation on the environment. Its Power Profiler enables consumers to compare the air emissions rates of the electricity generated in their region with the national average and determine the impact of their own electrical usage. The database on regional emissions rates that underlies the Power Profiler is available as well. The EPA also offers a Personal Emissions Calculator that can help consumers estimate their household's greenhouse gas emissions, explore actions they can take to reduce their emissions and energy use, and see how much they can save by taking the actions selected. The EPA's Greenhouse Gas Equivalencies Calculator translates abstract measurements into concrete terms. The U.S. Energy Information Administration collects data on home energy usage and expenditures. The EIA Residential Energy Consumption Surveys are conducted every four years and include tabulations by housing unit, household demographics, and geographic characteristics. Lets Go Solar has several useful links. Lets Go Solar offers a great deal of information about why and how to install solar panels. The information is state specific and compares multiple types of panels and inverters. The websites of a number of nonprofit organizations provide valuable information about global warming, clean energy, and tips for consumers on ways to reduce energy consumption and greenhouse gas emissions. Natural Resources Defense Council, for example, works on a comprehensive set of environmental issues, including global warming and clean air and sustainable communities. The Union of Concerned Scientists is another good source of information about global warming, clean cars, and clean energy.